With graduation events now drawn to a close across the country, it’s easy to forget the years of study and planning that had been invested into the success of just that one day. Awash with celebrity commencement speakers, proud parents and the prospect of summer ahead, the achievement of graduation itself is rightfully something to be celebrated and remembered. And according to this year’s National Retail Federation (NRF) survey on graduation spending we’ve been doing just that, and in a big way. The annual survey reports that the Class of 2015 will have generated a record $4.8 billion in graduation gifts and mementos and, having tracked graduation spending for a decade now, the NRF also states that total has never been higher. 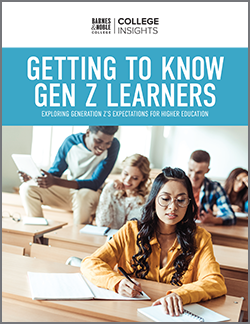 Yet for Barnes & Noble College bookstores across the country, the focus has been more on support than sales, with the emphasis on preparing their graduating classes for their special day. No stranger to the effort required for a successful graduation season, the University of Maryland’s University Book Center Manager, Myra Haley, had graduation in her sights since Spring Rush. “We have ten to twelve thousand students graduating here in the spring, so we hold our Grad Fair early on the week before the spring break in March,” she says. 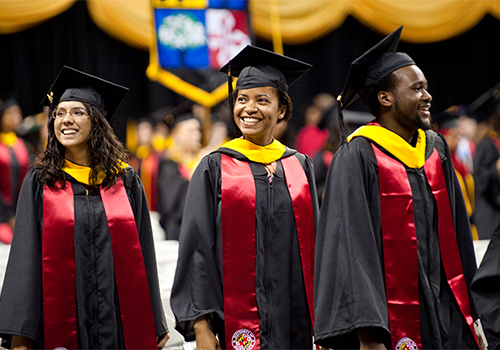 The store started prepping by ordering regalia in January, which is a much-needed lead time at Maryland, where the graduation gowns are made of eco-friendly, recyclable materials and emblazoned with a special school emblem. Getting the word out that the store can be an important resource for students starts early too, and Spring Rush saw the beginning of flyers being posted throughout the Stamp Student Union and around campus. “We also have a postcard in every book order that goes through the store during rush and, closer to the event, we have a chalk team chalking the sidewalks on the week prior to the Grad Fair. 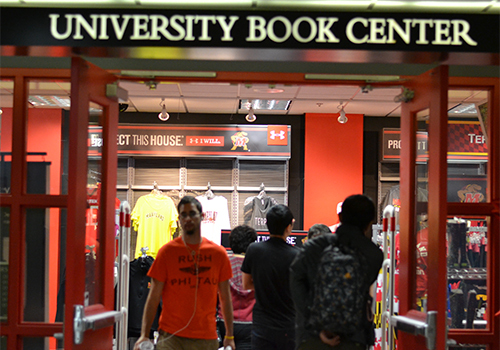 If it’s hard to miss the Maryland Grad Fair event, the bookstore is hardly alone in its promotional efforts. “It’s our responsibility as an institution to really support our graduates and make sure they have everything they need to know for graduation,” explains Dr. Marsha Guenzler-Stevens, Director of the Adele H. Stamp Student Union. 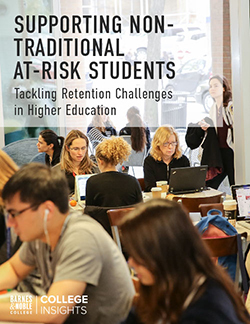 “The bookstore has always been involved in that process from the point of view of robe rental and memorabilia, but by colaborating with the Alumni Association and Senior Council, the Grad Fair gives us an opportunity to provide one seamless pre-graduation experience in a central location,” she adds. Part of that experience is an opportunity for celebration as Haley notes. “We aim to create not just a supportive environment at the bookstore, but also a reason to come in and celebrate graduation,” she says. “As part of our Grad Fair, we offer refreshments, a raffle and music.” And while that celebratory environment can help reduce concerns about commencement, the bookstore team and campus representatives are also on hand as an additional resource for the students. “If there’s a question, we aim to answer it,” Haley adds. During the three-day event, the store’s textbook department is condensed to accommodate the fair tables to allow more room for participants. Vendors such as Balfour and Church Hill Classics were also available for students to order their class rings and diploma frames, as well as offer helpful information and advice to grads. Haley also believes features such as students being able to physically pick up their caps and gowns also helps act as a reminder for graduation. The event also provides some valuable interaction with other student organizations at a key time in students’ lives. “This year in particular, the Alumni Association was able to do a great job of reaching out to students and building not only individual, but lifetime memberships at the event,” Guenzler-Stevens reports. 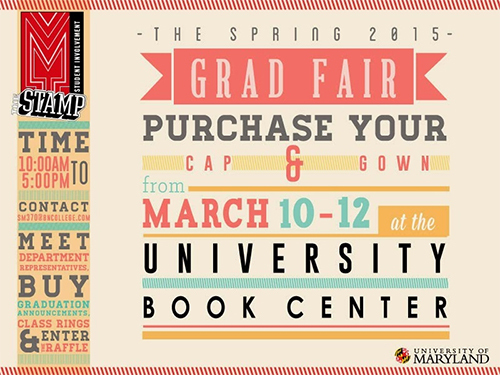 At Maryland, this year’s Grad Fair attracted over 5,000 graduates, under-graduate, masters and PhD students, and in between the popular diploma frames and graduation tassels flying off the shelves of her store, Haley’s commitment, and that of her team, is to ensure the success of a single day. “Graduation is something I’ve been involved with for over fifteen years,” she says. “It’s something near and dear to my heart, and I’ve seen that Grad Fairs play an important roll in supporting that big day. Where else can you go to speak to career services, the alumni office, or senior council, pick up your cap and gown and order your ring in one centralized place?” she asks.